DOE’s Fuel Economy Site includes a downloadable PDF version of the Fuel Economy Guide: Model Year 2000. The Guide was prepared from data compiled by the EPA. It is intended to help consumers compare the gas mileage of similarly sized cars, light-duty trucks, minivans, sport utility vehicles, and special purpose vehicles. Hard copies of the 2000 Guide have been printed on recycled paper and may be acquired by calling the National Alternative Fuels Hotline at 1-800-423-1363. The Fuel Economy Site also includes information about advances in fuel economy technologies, tips on making current vehicles more fuel efficient, and links to related sites. Natural disasters, such as hurricanes, fires, floods, and earthquakes, have always been with us. New on the stage, however, is a web site from the Center of Excellence for Sustainable Development Disaster Planning Section. It provides a host of useful information to help communities prepare for, and recover from, these natural disasters in a sustainable manner. In addition, DOE's Fresh Start website serves as a gateway to information on disaster planning and recovery. The SD Gateway includes more than 1,600 links in the SD Primer, a calendar of events, a job bank, the Sustainability Web Ring, and listings of mailing lists (listservs) and news sites dealing with sustainable development. Future plans include new pages focused on collaborative work on sustainable livelihoods, environmental law, public participation, sustainable cities, and water. The SD Gateway will also be sharing their experiences with using the Internet to communicate about sustainable development. Visit the SD Gateway at http://sdgateway.net. Ecologically Based Municipal Land Use Planning is now available from CRC Press/Lewis Publishers. This book by William B. Honachefsky incorporates the latest scientific research, modern GIS (Geographic Information Systems) mapping techniques, and a host of unique ecological indicators into a new approach to local land use planning. The goal of this new approach is to broaden the planning process beyond the relatively narrow considerations normally involved when making zoning decisions. Ecologically Based Municipal Land Use Planning provides easily understood, nuts and bolts solutions for controlling urban sprawl, emphasizing the integration of federal, state, and local policies and plans. It discusses many ecological resource issues and provides practical solutions municipal planners will be able to implement. Communities by Choice serves as a virtual community for people who share a common interest in sustainability. The purpose of this virtual community is to foster learning among sustainable community development practitioners by providing them with access to the best sustainable community development resources available. The site includes a Community Assessment Guide and many other resources. Visit at http://www.communitiesbychoice.org. An interesting new preventative maintenance service is now online from Opms.Net. Opms.Net provides an online management solution for planning and controlling an organization's maintenance activities. Its purpose is to simplify the planning and administrative functions of maintenance management. Opms.net is designed to meet the diverse maintenance requirements of industrial, commercial and residential facilities, health facilities, hotels, schools, and municipalities. It includes an online demo allowing a visitor to get a feel for the capabilities of the system. Visit at http://www.opms.net. A new book from Greenleaf Publishing -- Mapping the Journey: Case Studies in Strategy and Action Toward Sustainable Development -- presents a series of in-depth case studies from around the world. These case studies are based on personal interviews with organization leaders and focus on their journey toward sustainability. They provide visions of a more sustainable future, and shed light on the path and milestones along the way -- in particular on the management processes these organizations have employed -- to provide a compass for others to follow. Mapping the Journey examines both public and private organizations worldwide: SJ Rail of Sweden; Sony Corporation; SC Johnson; TransAlta Corporation; Patagonia; Henkel; Volvo; ASG; Interface Flooring Systems; Suncor; DaimlerChrysler; AssiDomân; Germany's Centre for Technology Assessment and the Dutch National Environmental Policy Plan. These case studies provide an inspiring framework of effective processes for defining a sustainable development strategy and transforming it successfully into actions and results. For more information, visit the Greenleaf website at http://www.greenleaf-publishing.com/catalogue/mapping.htm. The NAHB Research Center is offering a 120-page Green Building Guide which describes green building program development and green building techniques. It analyzes six programs to determine the most effective requirements and incentives, and it covers details like organizational structure, budgets, technologies, and other issues. It lays out the steps to create a program and includes a Green Builder Program Template. It also includes additional references for everything from framing materials to xeriscaping. The Guide is available for download in PDF format here. A printed copy with a CD (so builders and associations can customize its ideas) may be ordered online from the NAHB Research Center http://www.nahbrc.org/publist/how2ord.htm. are natural and mutually reinforcing partners. 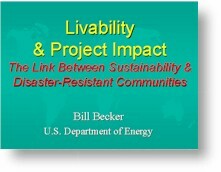 Projects initiated to mitigate disaster threats or recover after disaster impacts can at the same time improve community design and provide for the construction, reconstruction, or retrofitting of utilities, infrastructure, and public buildings to be more sustainable. To see the presentation, click here. Smart Growth News is published weekly and is available from Urban Land Institute at no charge by e-mail subscription. Each issue contains 25 to 30 abstracts of articles culled from more than 1,400 information sources, including major national newspapers, business magazines, Web sites, national and international wire services, and periodicals focusing on housing, development, and real estate. Smart Growth News covers regional planning initiatives, transportation, affordable and infill housing, environment and open space conservation, master-planned communities, economic development, and urban revitalization. Clean Energy for the 21st Century includes information on clean energy technologies and Energy Awareness Month activities. You can download or request copies of Clean Energy publications, find information about Clean Energy supporting events and activities, and find links to other clean energy related sites. Visit at http://www.eren.doe.gov/cleanenergy. Shelterforce Online, from the National Housing Institute, is offering a new web site about Comprehensive Community Initiatives and community building. Includes Shelterforce projects, articles, and additional sources of information.